Ready-to-use metal repair putty, dent filler and patching compound. Durable metal filler for fast, permanent repairs. A unique, quality problem-solver! Lab-metal ready-to-use repair compound spreads like paste and hardens quickly into metal. Lab-metal fills dents and flaws in metal and nonmetal parts easily and economically. Apply Lab-metal right from the can with a putty knife or similar tool. No two-component mixing or measuring is necessary, therefore there is no waste. Heat, special tools and specialized skill are unnecessary. Many applications may be made from a single can. Lab-metal may be thinned to paint consistency with Lab-solvent and brushed or sprayed on practically any surface to provide a rustproof, water resistant, hard metal finish. Once hardened, Lab-metal can be milled, chiseled, drilled, sawed, tapped and machined. Filing, sanding or grinding Lab-metal to a feather edge provides a smooth metallic repair. Lab-metal will not shrink, crack or peel. Not affected by mild acids, gasoline, oil or petroleum solvents. 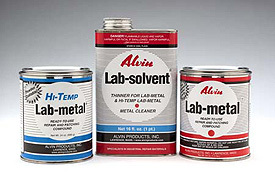 Lab-metal is aluminum filled, resisting attack of rust, rot and mildew. Lab-metal withstands temperatures as high as 350ºF (and as low as -40oF) and when hard, can be painted with lacquer or enamel without danger of bubbling, lifting paint, chipping or peeling. Lab-metal stands up to normal paint baking procedures and may also be powder coated (see special powder coating instructions). Lab-metal’s true metal hardness is achieved with greater ease than other materials sold for repair and finishing. Lab-metal sells for considerably less than epoxy systems. Its strength, hardness, durability and abrasion resistance surpass basic requirements for fillers set by the nation’s largest metalworking plants. Lab-metal is the repair putty of choice because of its extensive can life, ready-to-use formulation, versatility of applications, and durability.